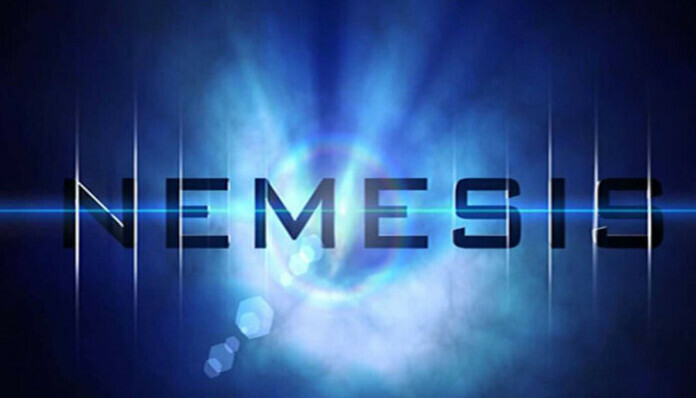 Nemesis Kodi Addon – The Long-Standing Addon Is Now Powerful More Than Ever! 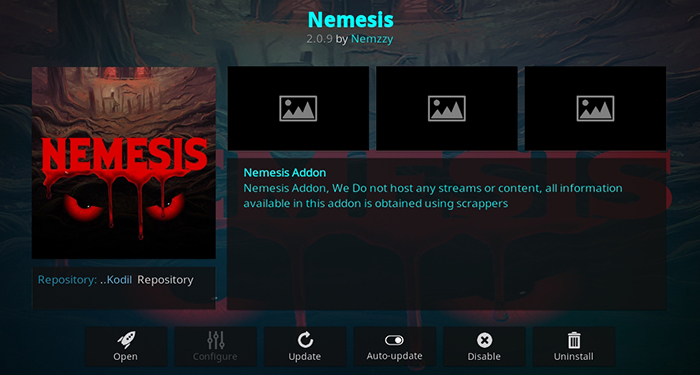 Update: Unfortunately, Nemesis is no longer among the Kodi addons that we recommend using. Due to technical issues and its inability to find fully-working links, we recommend you avoid using this addon. However, there’s no need to worry as plenty of fully-working alternatives await. 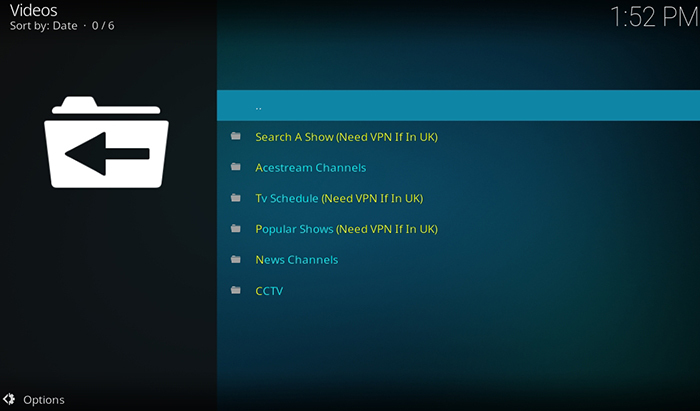 You’ll find all the information you need in our central ‘Kodi Addons’ article. Kodi is an open-source and completely free-of-charge, multi-platform home theater software that has been of great use to numerous Kodi users around the world. Right from watching cable-free TV, free movies, extending to free TV Shows – Kodi allows you to access all of those privileges. Not to mention, Kodi comes without any setup fees, monthly charges, or unwanted ads/pop-ups. On top of that, you get to use third-party addons. We are about to take a look at one of the most popular options – the Nemesis Kodi addon. If you ask Kodi users what they like the best about this application – they will point you to popular Kodi addons. In general, you don’t need to use addons if you have a large collection of media, locally stored. However, media streaming always sounds like an interesting option. As you are about to see, addons for Kodi collect thousands of sources all over the Web. They serve as ‘scrappers’ that bring you streamable media. In addition, they tend to specialize in certain kinds of content. For example, there are movie addons or Live TV addons. Many of these bring the highest possible video quality. If you’re out there in search of a mega-solution on video streaming, your search ends with Nemesis. This addon offers a collection of different types of media that you’ve been dreaming about. We don’t know about you, but we are sure that this is the addon you don’t want to be without. If you decide to try it and get the experience yourself, use our guide to help you download and install it. Ever since it was released, this addon was contained within a repository called Stream Army. Aside from this addon, this is where you’ll find other interesting options. Therefore, make sure to try those out as well. Important Note: Prior to installing the Nemesis addon in 2019, you need to make sure that your Kodi works with third-party addons. You will be surprised to hear that this isn’t the case by default. As a safety measure, you need to visit Kodi’s settings and allow any addon to be installed. Essentially, what you need to do is to enable ‘Unknown Sources’ on your Kodi. This is a very quick process and we’re sure you’ll manage to do it just fine. Use the provided link for more information. Since the Nemesis Kodi addon can’t be found within the official Kodi repository, we will need to access the Stream Army repository, where it’s located. While in the ‘Video Add-ons’ folder, find Nemesis and click on its name. You should see an overview of this addon. Finally, click on the ‘Install’ button in the bottom-right corner. 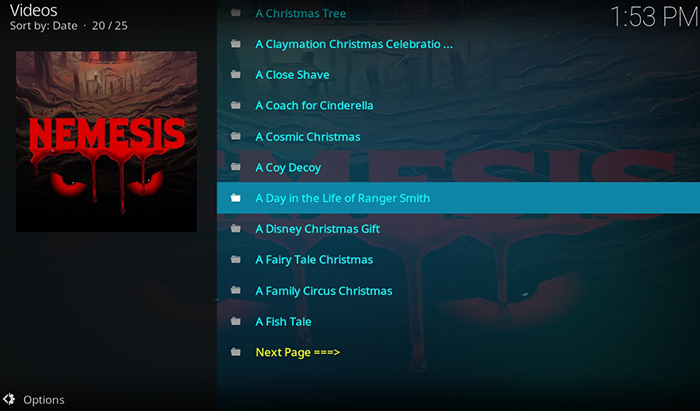 Wait for up to a minute for the Nemesis add-on files to download and install on Kodi. If this is your first time installing an addon, this process might take a while. Once finished, you should see a notification of successful installation in the top-right corner of your screen. What to Expect From Nemesis Addon? You’ve downloaded and installed the Nemesis Kodi addon. So, you might be wondering what is next? First, let’s take a look at what this addon offers and why it’s unique in comparison to its competition. Sports Zone is using several different content suppliers. In the majority of cases, the Infinity Sports will bring everything you need. There are also some dedicated sections for football (soccer). Scanner Zone brings live streams of police dispatch feeds. As such, this option is unique when it comes to Kodi addons. Select a state, or check out the 25 most popular. Movie Zone brings a nice selection of movie separated into different categories. Nemesis is one of the rare addons that bring 4K and even 3D movies as well. TV Zone comes with a nice selection of live TV channels from all around the world. In addition, you can tune to a number of CCTV camera feeds. Conspiracy Zone brings documentaries. We were having problems with this content section since it something works and sometimes doesn’t. Music Zone isn’t only about music streaming. Aside from playing the top lists, you can watch concert replays as well. Audio Books is a very interesting option that we didn’t find anywhere else. You get to filter down your search by typing a topic. Air Traffic Control Zone seems to be broken at the moment. We are sure it sounds interesting to listen to airport communications, it seems like you’ll have to wait for this option to work once again. Anime Zone is the go-to place for every fan of Japanese anime. A sizeable collection awaits. Kids Zone comes with numerous collections of both old and new cartoons. However, you will have to search by letter, which isn’t the most intuitive way to filter your choices. Adult Zone, as its name implies, provides content suitable for mature audiences. You will have to set up a password first thought. 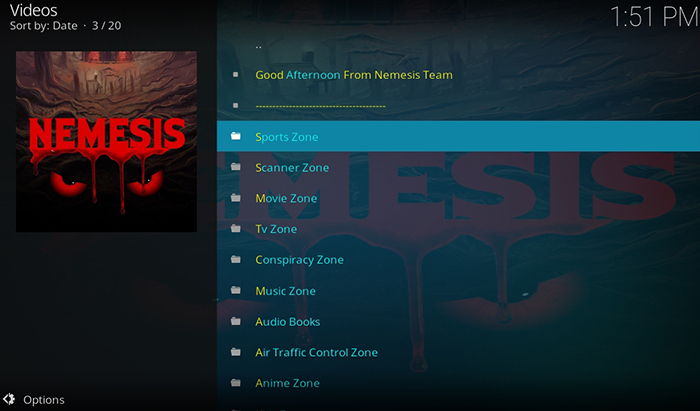 Request Zone is the final option on the home page of the Nemesis Kodi addon. You will get to see a few items in here but most of these are there for testing purposes. We can all agree by now that Nemesis is a one of a kind add-on built for Kodi. Thanks to its awesome features, Nemesis has already hit the streets of Kodi as a major game changer in the world of add-ons. Just having Nemesis add-on installed on your Kodi is already enough when it comes to video streaming. If you’d like to add something, feel free to post a comment. We’d love to hear what you have to say. Also, let us know if you have any alternatives for this amazing addon?